Peterson and Sherlock Holmes, together again! It’s been a long time coming, and whether by accident or design, is welcome all the same. 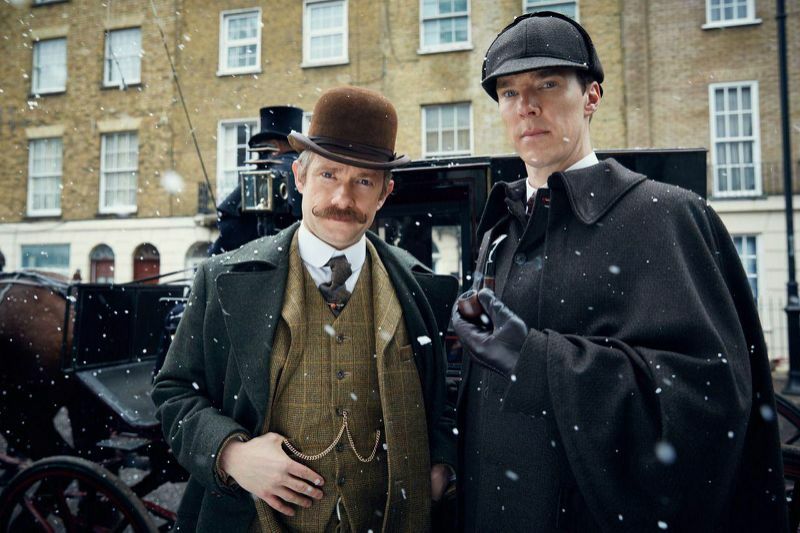 I spent last night watching the much-anticipated period episode of BBC’s Sherlock, “The Abominable Bride,” * followed by all its bonus materials. I’d hoped to find some frames with the Peterson pipe to capture for the blog, but there just wasn’t anything that stood out. 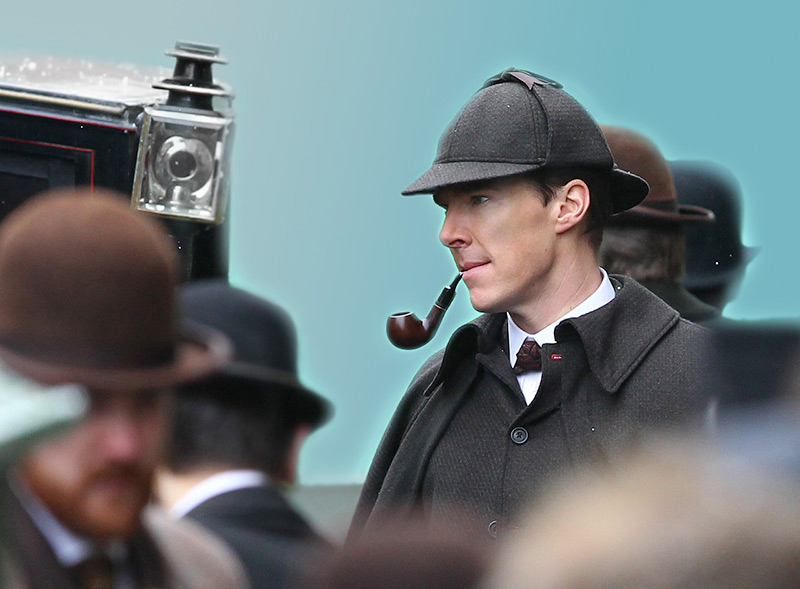 With the help of publicity stills, however, after viewing the film and various bonus materials, it’s safe to say Benedict Cumberbatch is using a Peterson Killarney XL02 with a saddle stem. The current Killarney line with ruby-red gloss stain and twin nickel bands sandwiching a black acrylic band, debuted around 1991. 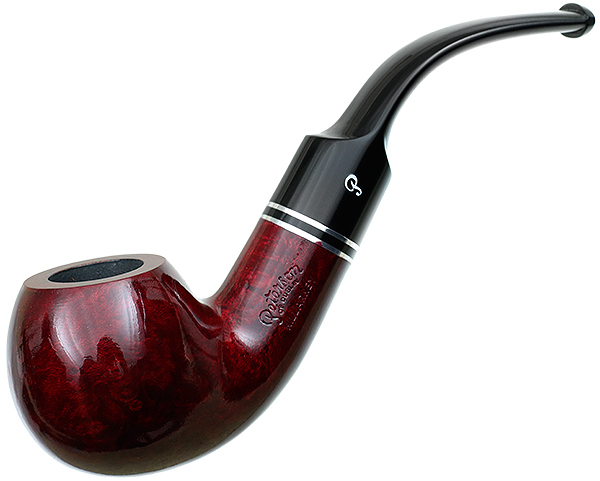 It features an ebonite stem and hot foil P on the stem and is an entry-grade Peterson line, retailing at about $105. In Germany, the same line is marketed with a 9mm filter mouthpiece as the Connemara line. 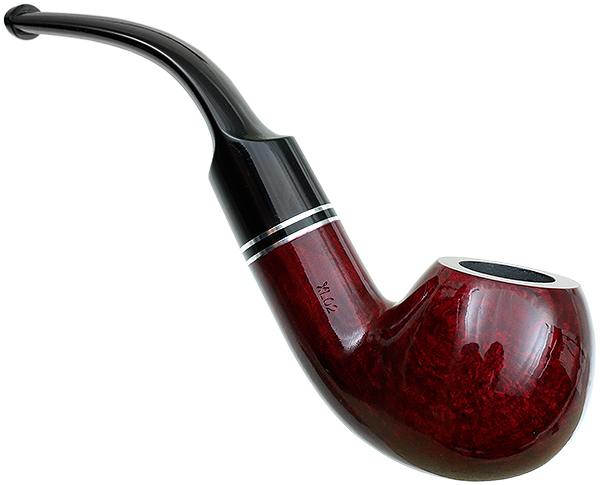 The XL02, an apple-shaped bowl paired with thick shank, is not part of the Sherlock Holmes line, as someone on a recent blog from one of my favorite e-tailers pronounced, although the Sherlock Holmes LeStrade, the XL23, could be mistaken for it. The shape debuted along with several others in the late 1970s as the 302 System, along with its little brother the 303, and has established itself, per Tony Whelan, Jr., at the factory, as one of Peterson’s top-selling shapes. ** It’s got a great chamber size for English and aromatic tobaccos, at about 19.5mm wide by 35mm deep. Peterson’s long-time association with Sherlock Holmes can’t be documented back to 1890s, but in The Peterson Pipe: The Story of Kapp & Peterson, we do unveil how they became associated in the late 1930s, and of course talk a great deal about the three Sherlock Holmes collections Peterson has issued since the late 1980s. After watching all the production specials on the Blu-ray, I couldn’t help but laugh at the irony of how much time and money went into finding authentic locations, period costumes and props, but when it came to one of the two most-defining props of the Great Detective, they simply dropped the ball. It’s very sad, really, that the UK, once the acknowledged purveyor of the finest briar pipes to the world, should have so turned its back that when it comes to something as simple as a briar pipe from 1895, one could not be sourced. Not that either Cumberbatch nor Freeman ever really seem to be smoking their pipes, but at least they’re using them, which is a step in the right direction. 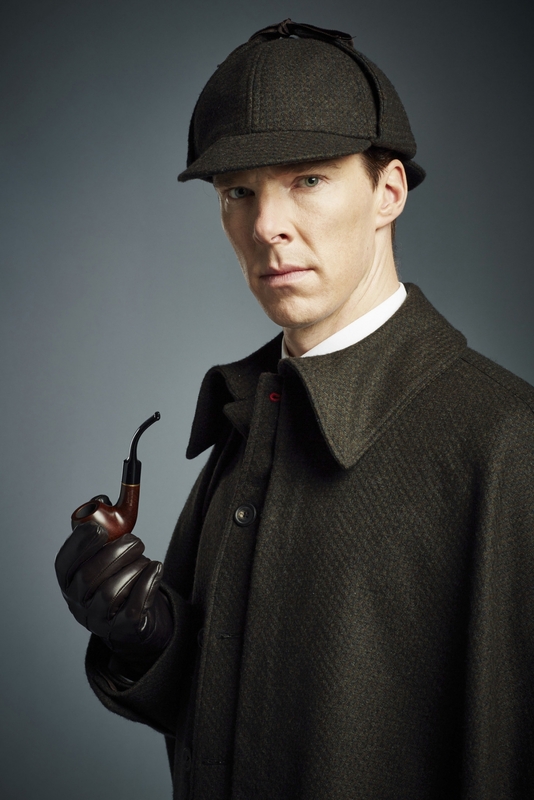 Oh for a nicotine-fiend Sherlock on the order of Jeremy Brett, Basil Rathbone or William Gillette. I will give Moffat and Gatiss, the creators of Sherlock, credit for loving camera attention to Holmes’s “black, oily clay pipe”—I don’t know whether it was the real item or just (as in the pathetic pipes of The Lord of the Rings and The Hobbit movies) papier-mâché. I suppose it’s not their fault they live in a Nanny-State or never fell under the spell of Sherlock’s tobacco fumes. Length: 5.50 in. / 139.70 mm. Weight: 2.10 oz./ 59.53 g.
Bowl Height: 1.70 in. / 43.18 mm. Chamber Depth: 1.36 in. / 34.54 mm. Outside Diameter: 1.72 in. / 43.69 mm. *Serious Sherlockians will recognize the title, “The Adventure of Ricoletti of the Club Foot and His Abominable Wife,” which Vincent Starrett calls “the most marvelous of all the missing titles” in The Private Life of Sherlock Holmes (Otto Penzler, 1993, p. 100). ** For readers of footnotes: the top-selling System shape is the 303, followed by the 314, per Tony Whelan, Jr.. Thanks for posting this. I haven’t seen the film yet, but will definitely be tracking the pipes when I do. Interesting and a bit disappointing that the production didn’t use vintage pipes for the occasion. If the real deal couldn’t be found, surely a few replicas could be made for the set. As I think about it, there is, actually, one possible explanation for the pipe that could plausibly be used given the narrative, but no plot spoilers! A Peterson System replica for 1895 would be fairly easy (aside from the tip of the mouthpiece, which wouldn’t be finalized until the 3rd patent in 1898), as most of the original System shapes are still being made, unaltered in any way since that time. I have that episode DVR’d, but haven’t had time to watch it (I don’t care for the regular show episodes). I’ll have to check it out! Interesting notes here! I haven’t seen the film yet, but really want to now. I, too, haven’t seen the episode. I’ll be looking for it. 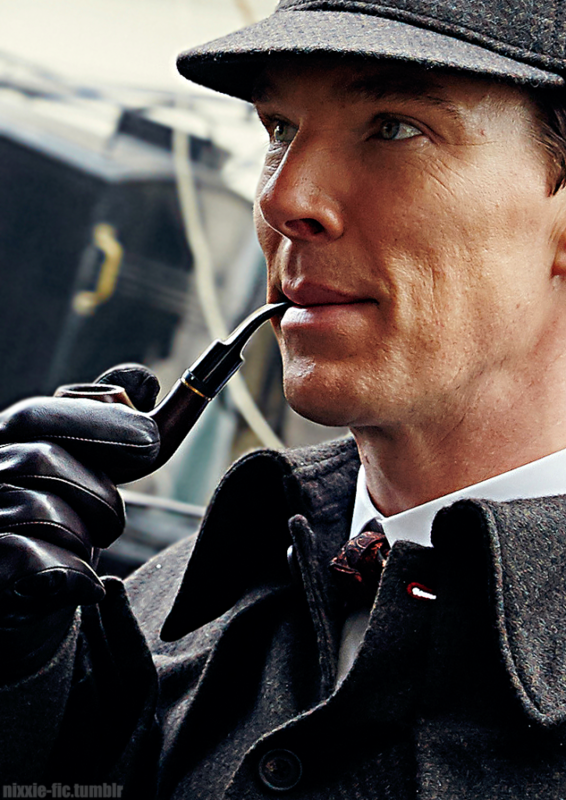 I’m afraid that with the anti-smoking situation now in evidence not much attention will be placed on the pipe and SH or Watson in the books of the tome. I must admit that I’ve been spoiled by first Basil Rathbone and then especially the Jeremy Brett versions. As a devoted Peterson and SH fan for many years, I have the first two SH Collections offered by Peterson in the smooth finish bought when they first came out. Rathbone’s HOUSE OF FEAR has to be the ultimate pipe-smoking Sherlock film. The pipes in the film, and the plot hinging as it does around pipe tobacco, is great fun. Can’t do without Jeremy Brett–the definitive film versions, surely. Purchased the BluRay/DVD combo pack for the missus, she being a fan of both the latest Sherlock series from BBC and Cumberbatch. I can also say I think highly of them both. ‘Am’ glad, though I will always miss Rathbone’s calabash, that they moved towards a pipe more in line with Doyle’s works. And disappointed that they didn’t put in the little extra effort needed to get all the way ‘to’ those works as regards the pipes used. Now, now.. if we are positing Sherlock drew every other detail of the Victorian period out of his mind palace to build his ‘world’ with, we have to posit that Victorian pipes were in there as well. They were as common in the period as waistcoats. You’re right. No need to be generous–let’s send Moffat and Gatiss What-For and get them to shoot those scenes over again. Nice try, but compare the forum photo to mine and to the blog photo of the Peterson pipe in question. You can also talk to Peterson themselves. Not that it really matters, right? Its positive those shots are not using a Pete. I’ll be at IPCPR tomorrow and will swing by the Peterson booth and talk to Tom and Conor and I’ll mention it. Very cool– say “Hi!” to Tom and Conor for me. Let us know what you find out. Tom and Conor say Hi back. Confirmed that pipe is not a Peterson, they, we, wish it was. Soooo I then went to the Lorenzo booth, it also is not one of theirs, they said it could be Lorenzeti or similar. Disappointing right? In a show that does things so very well, to have fallen down on the job here. The photos posted at the forum were difficult to read (at least to me) — of course, I didn’t see the digital enhancements, etc. — but there you have it, Word from the top! Thanks so much! Here is one more bee to put in the briar-bonnet of Abominable possibilities: did you know that Peterson bowl shapes can sometimes be found under other marques? Yup. Look at the inside cover of a number of Pipes & Tobaccos Magazines and you’ll see several Peterson bowls that other companies have “appropriated” — remember the same company that cuts Peterson’s bowls also cuts a number of lesser-quality company’s bowls as well. I wonder if it isn’t the Peterson bowl, released through a “basket pipe” company? Yeah they are a sub-brand Italian company if its Lorenzeti… very possible.